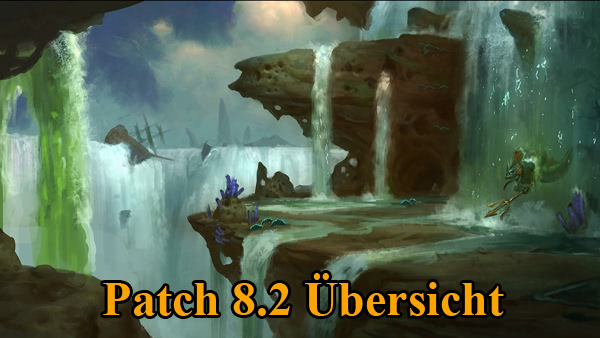 Gestern hat Blizzard das neue Azerit-System aus Patch 8.2 vorgestellt. Nachdem wir die Funktion kennen, interessieren wir uns jetzt natürlich über die neuen aktiven Fähigkeiten und passiven Boni. Sloot ist einer der Teilnehmer beim aktuellen Blizzard-Event gewesen und konnte sich scheinbar einige der neuen so genannten Essenzen merken. Unsere Kollegen von Wowhead haben diese Infos in einem neuen Artikel zusammengefasst. Beachtet aber bitte, dass es sich um eine sehr frühe Version handelt und sich noch vieles ändern wird. 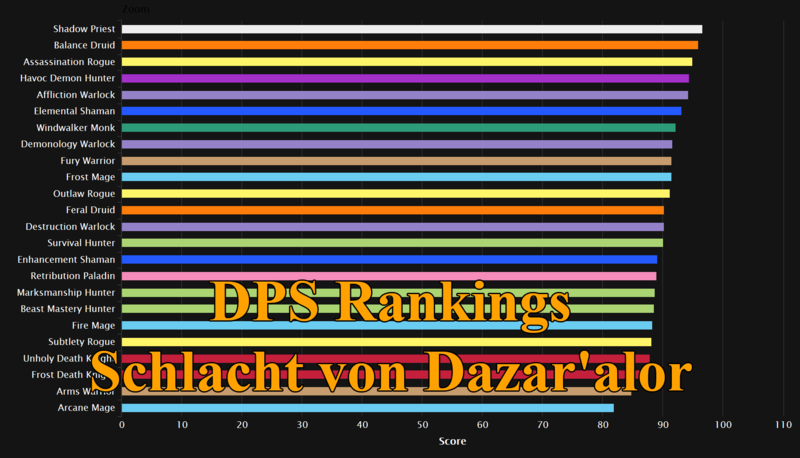 Die Testphase zu Patch 8.2 beginnt ja erst nächste Woche. Major Power: The elements protect you, reducing the damage you take from each attack by 1,955 for 10 sec. While active, heal for 2,715 health when damaged. Minor Power: You gain 113 Versatility for each enemy within 10 yards, up to 565 Versatility. Additionally, you heal for 1,224 health every 4 sec for each stack of Aegis of the Deep on you. While below 35% health the Versatility amount is doubled. Major Power: Burn enemies with the essence of the own life, sacrificing 10% of your maximum health to deal Fire damage to all nearby enemies equal to that amount. Heal for 10% of your maximum heal per enemy hit, up to a maximum of 50% of maximum health. Minor Power: Infuse yourself with burning embrace, increasing your maximum health by 3,430 every 4 sec, stacking up to 15 times. Major Power: Create a field of Azerite energy at your current location for 10 sec. While standing in this area, you gain a stack of Engine of Haste, Engine of Mastery, and Engine of Critical Strike every 0.5 sec. While inside of the Engine of Ceaseless Progress area, take 10% reduced damage. When you activate Engine of Ceaseless Progress, the stack count of Engine of Haste, Engine of Mastery, Engine of Critical Strike is immediately increased by 100%. Minor Power: Every 2 sec, the Heart of Azeroth empowers you with 16 Haste, Mastery, or Critical Strike. 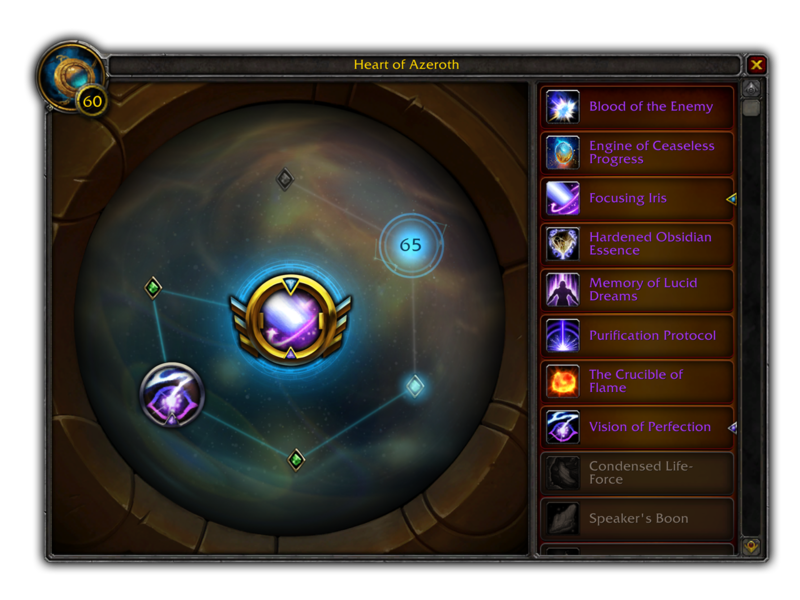 After reaching 10 stacks of either Haste, Mastery, or Critical Strike, the Heart of Azeroth temporarily overcharges, doubling the effects of Engine of the Ceaseless Progress for 8 sec, after which the stacks are removed. When you gain a stack of one of the Engine buffs, you have a 20% chance to generate an additional stack, and a 10% chance to gain all three Engine effects instead of a random one. Major Power: Your next death is prevented, and you instead regenerate to 10% of your maximum health and take 85% reduced damage for up to 10 sec or until you are healed above 70% health. Cannot occur more often than once per 7.5 min. Minor Power: The sands of the infinity swirl around you, increasing your Versatility by 466. This Versatility is reduced by 50% for 7.5 min if you die. Major Power: Encase yourself in hardened obsidian, reducing all damage you take by 40% for 2 sec, then 20% for the next 2 sec. Minor Power: When you fall below 35% health, obsidian hardens your skin, granting you 7,604 Armor for 4 sec, then 3,802 Armor for the next 4 sec. This effect may occur once every 120 sec. Major Power: Clear your mind and attune yourself with Heart of Azeroth, increasing your Mana generation rate by 100%, and your Leech by 874, for 10 sec. Minor Power: Your spells and abilities have a chance to refund 50% of the Mana spend on them and immediately heal you for 10,860. When Lucid Dreams refunds some Mana to you, gain Versatility for 8 sec. Major Power: Gain an empowered Null Barrier, absorbing 174,235 magic damage for 10 sec, and instantly remove all harmful Magic, Curse, Poison, and Disease effects on you. Minor Power: Every 15 sec, gain a Null Barrier, absorbing the next 34,684 magic damage you take for 10 sec. When Null Barrier expires, it implodes, dealing Shadow damage equal to the total amount absorbed, divided among all nearby enemies. Major Power: Unleash a heavy pulse of suppressive energy, reducing the movement speed of all enemies within 15 yds by 70% and reducing their damage done to you by 10% for 8 sec. If this hits an enemy, your movement speed is increased by 50% for 8 sec. Minor Power: Enemies who melee you will attack 8% slower, and you gain 434 Haste and 15% increased attack speed for 7 sec. Major Power: Blast your target with a ball of concentrated flame, dealing 21,720 Fire damage to an enemy of healing an ally for 21,720, and grants you 5.0 sec of the Ancient Flame buff. Every time you cast Concentrated Flame, the damage or healing value is doubled, up to 2 times, then it resets. Minor Power: Your spells and abilities have a chance to grant you Ancient Flame for 10 sec, increasing your Critical Strike by 150 and your Leech by 64, causing your damage and healing spells to engulf their target in cleansing flame for an additional 10% of the damage or healing done over 4 sec. Major Power: Your spells and abilities have a chance to activate Avenging Wrath for 8.0 sec. When the Vision of Perfection activates, the cooldown of Avenging Wrath is reduced by 15%. Minor Power: Reduces the cooldown of Avenging Wrath by 16.5% and increases your Versatility by 419. When you activate Avenging Wrath, immediately heal for 5% of maximum health. Major Power: Concentrate energy into the Heart of Azeroth, immediately causing 3 Azerite Shards to erupt from the nearby ground. Minor Power: Every 18-25 sec, a shard of Azerite erupts from the nearby ground for 12 sec, granting you 0 Strength while you are within 8 yards of it. Source: Complete a Call to Arms Warmode quest in Season 3 or 4, obtain one of the High Warlord Volrath in Mugambala, Zuldazar. Major Power: A time vortex around a friendly target absorbs 496,932 damage and 496,932 healing for 6 sec. When this expires, the absorbed damage and healing occurs periodically over 10 sec, and the damage is reduced by 20%. Minor Power: Your heals have a very high chance to grant the target 304 Haste and 317 Speed for 6 sec. Major Power: Implant 40 Seeds of Eonar divided over all allies within 30 yds. Seeds that expire unused reduce the cooldown of this ability by 2 sec. Minor Power: Your heals have a very high chance to implant a Seed of Eonar in the target, causing 298 healing ever 1 sec for 15 sec. If the target takes damage, the Seed bursts, healing them for 6,198. Major Power: Overcharge the Heart of Azeroth, causing each spell you cast to increase your healing by 4% for 10 sec, and granting 10% haste, but halting your mana regeneration. Last 10 sec. Minor Power: Your heals have a chance to grant either 1,617 Intellect for 10 sec or 2,723 mana. Chance of receiving mana increases with your missing mana. 20% chance to gain both effects. Major Power: Direct the Vitality Conduit toward an ally. Every 0.5 sec for 6 sec, they absorb 17,890 health from the highest-health ally within 30 yds and are healed for 21,468. Vitality Conduit triggers its healing burst around the target at the start and end of this effect. Minor Power: Your heals have high a high chance to create a burst of energy around the target that heals up to 5 allies within 12 yds for 4,331. Heals for an additional 200% if no other allies are within range. Major Power: Release all healing stored in The Well of Existence into an ally.Minor Power: 20% of your overhealing is stored in The Well of Existence. When you heal a target under 50% health, the Well releases up to 9.939 of its stored healing into them. Source: Purchasable from the Rustbolt Quartermaster in Mechagon at Honored Reputation. Major Power: Focus excess Azerite energy into the Heart of Azeroth, then expel that energy outward dealing 126,700 Fire damage to all enemies in front of you over 2.7 sec. Focusing Iris can now be used while moving. Minor Power: Every 2 sec, the Hearth of Azeroth absorbs nearby latent Azerite energy, increasing your Haste by 29, stacking up to 10 times. While at 10 stacks of Focusing Iris, your Heart of Azeroth has a high chance to blast your target with a bolt of Azerite Energy, dealing 5,692 Fire damage. Major Power: The Heart of Azeroth erupts violently, dealing 38,006 Physical damage to enemies within 12 yds. You gain 25% Critical Strike chance against the targets for 15 sec. Increases your Critical hit damage by 35% for 15 sec. Minor Power: Your Critical Strikes grant a stack of Blood of the Enemy. Upon reaching 25 stacks, you gain 1,052 Haste for 12 sec. Each stack of Blood of the Enemy grants 29 Critical Strike. Blood of the Enemy has a 25% chance of only consuming 15 stacks. Major Power: Call down a Purifying Blast at the target location, dealing 11,680 Fire damage to all enemies within 8 yds every 1 sec for 6 sec. Purifying Blast damage has a chance to immediately kill any specimen deemed unworthy by MOTHER. Any Aberration struck by the Purifying Blast is stunned for 8 sec. If an enemy dies while inside of your Purifying Blast, your damage dealt is increased by 10% for 8 sec. Minor Power: MOTHER has added a Purification Protocol, to your Heart of Azeroth, allowing your damaging spells and abilities to release a blast of Azerite energy at your target, dealing 35,041 Fire damage to any enemy within 8 yds, and heals you for 1,946 every 2 sec for 8 sec. Purification Protocol deal 100% additional damage against Abberations. Major Power: Call upon Azeroth to summon a Guardian of Azeroth to aid you in combat for 30 sec. Minor Power: Your spells and abilities have a high chance to impale your target with a spike of Azerite, causing 13,655 Physical damage. Source: Defeat Azshara in the Eternal Palace on Normal difficulty. Major Power: Unleash the forces within the Heart of Azeroth, causing a shard of Azerite to strike your target for 5,521 Fire damage every 1 sec for 10 sec. This damage is increased by 300% if it critically strikes. Minor Power: Each time you critically strike, you gain a stack of Reckless Force, up to 5 stacks. Every 10 seconds, your next spell or ability will barrage the target with one bolt of Azerite energy per stack of Reckless Force, dealing 552 Fire damage each.